I’ve visited Texas many times over the years – my aunt moved to Dallas almost 30 years ago and my sister and I visited often when we were little. The highlight used to be watching the latest Disney film at the cinema before it had come out in the UK, and later going on shopping sprees at the mall; not to mention eating out a lot. And the cinnamon toast. I loved the cinnamon toast. The first thing I said to my cousin when I arrived was that he had to take me line dancing. In the end he arranged for an evening of two-step, which apparently is more typical for Texas but had me feeling quite nervous as it sounded like “proper” dancing. And so it was that we drove to the biggest dance hall (or any hall) I’ve ever seen, dominated by what was essentially a racetrack with various bars in the middle and all around the outside. Two-step essentially consists of the same three steps (yes, three!) over and over: quick-quick-slow, quick-quick-slow. You can do some spins and other fancy things but most of us simply quick-quick-slowed our way around the track. Our dance skills (or at least our confidence) improved as the night progressed – completely unrelated to the amount of beer and shots that were consumed, I’m sure… There was even a bit of line dancing, hurrah! It’s actually a really nice change to go out for some couples dancing compared to the solo hip shaking that’s more common nowadays. We didn’t make it to a rodeo event but I did experience the next best thing. My cousin, very supportive in trying to give me the authentic Texan experience, kindly nudged me in the direction of the mechanical bull during that night of two-stepping. Okay, he dragged me up there. I think I did pretty well (there’s even a video on YouTube to prove it) – although I’m sure the operator went easy on me and didn’t push up the speed and rotation to the levels the bull is capable of. The tricky thing is that you have to hold on with just one hand and keep the other up in the air – all the while making appropriate facial expressions, of course. It’s a strange thing to do really but after seeing it in films for so many years I feel it’s a worthwhile experience to have had. 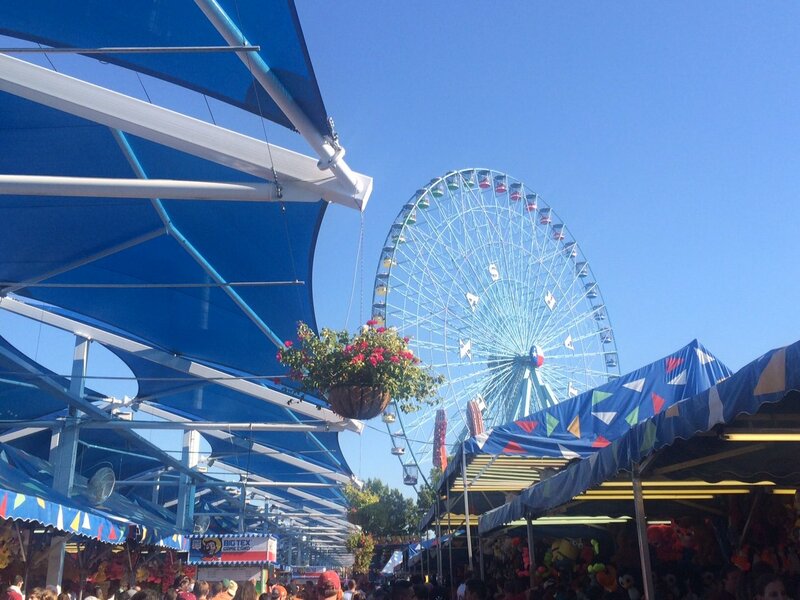 My other cousin also offered up her services in my Texan tourist quest and came along with me to the annual State Fair. I imagined something similar to what I’d seen in films like Meet Me in St Louis, Pollyanna, and Chitty Chitty Bang Bang – and, to be honest, it wasn’t far off. Attractions included the world’s oldest alligator, the world’s smallest horse, and even a freak show – none of which we paid to enter, I should hasten to add. We focused our attention on the culinary experience: first, a foot-long corn dog; then a red velvet funnel cake. I had hoped to find some fried cookie dough along the way, but thankfully we couldn’t locate that stand and eventually gave up as the crowds took over. It was “OU weekend”, the busiest weekend at the fair as Oklahoma University played Texas at the Cotton Bowl stadium and a host of maroon shirts (OU fans) mingled with all the burned orange-coloured shirts (TU fans). (The uniform for women otherwise, as I’ve found at the two-stepping and here at the fair, is cowboy boots plus teeny tiny hot pants – just so you know.) We also took a ride on the Texas Star, North America’s highest amusement ride (of course! ), and snapped a selfie with Big Tex, the mascot of the State Fair. Telling Congress where it’s at. So I initially resisted suggestions of going to the George W. Bush Library and Museum but I’m glad I succumbed in the end (but don’t tell my aunt I said that). It’s a strange kind of experience really, going to such a politicised museum, but it was an interesting reminder of the key events of Bush’s presidency as well as offering an insight into who he was as an individual. 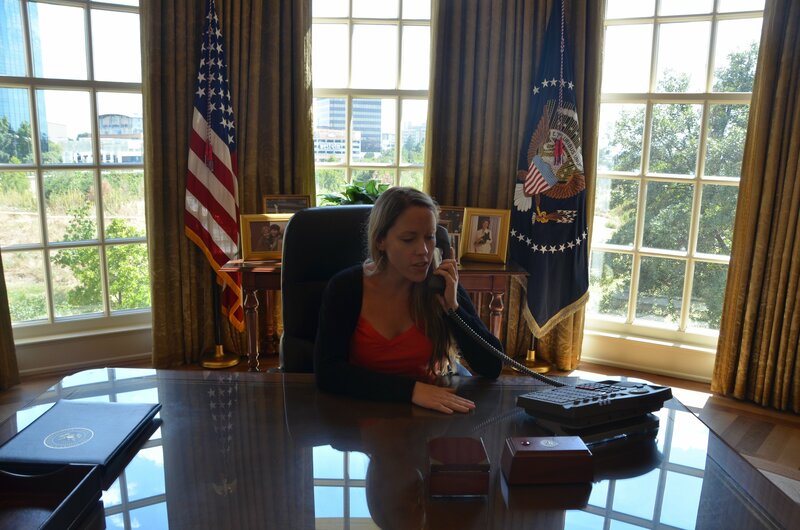 Highlights included visiting a replica of the Oval Office as it looked during his term as well as the interactive “decision point theatre” where we got to see how difficult it is to make a call on complex issues when your advisers are all saying different things. We also got to watch how George W. Bush successfully threw the first pitch to open a Yankees game – a big deal, apparently. Now as the saying goes, “everything is big in Texas” – and that’s no exaggeration. People also eat out a lot here, and we’ve done so every day. We’ve eaten a LOT of food, of every type of cuisine there is – Tex Mex of course, as well as Argentinian, Hawaiian, Japanese, Indian, Lebanese and good old-fashioned American. Although portions are big (think all-you-can-eat chicken wings), you can always take the extra food home in a doggy bag. It’s not just the size, though, as they also do an incredible job at making even the healthy unhealthy: who ever heard of adding sugar and cinnamon to sweet potato?! Or candying the walnuts in your salad? I can also particularly recommend the whiskey cake at Whiskey Cake. Yu-um. From Death Valley, we drove on through the desert past Las Vegas – my worst nightmare, we steered well clear of this neon monstrosity. 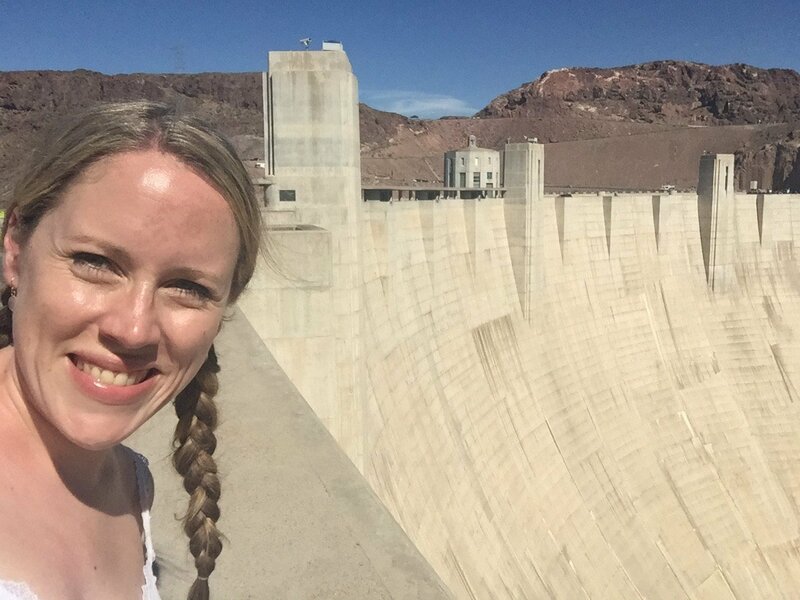 We did add one extra stop, however, on the way to what I knew would be the highlight of our trip: suddenly Hoover Dam appeared on the map on the way to the Grand Canyon so of course we had to take a peek. My aunt had already visited the Dam before so she very kindly drove back and forth along the Dam (rather than pay the parking fee) as I made my way across taking selfies! 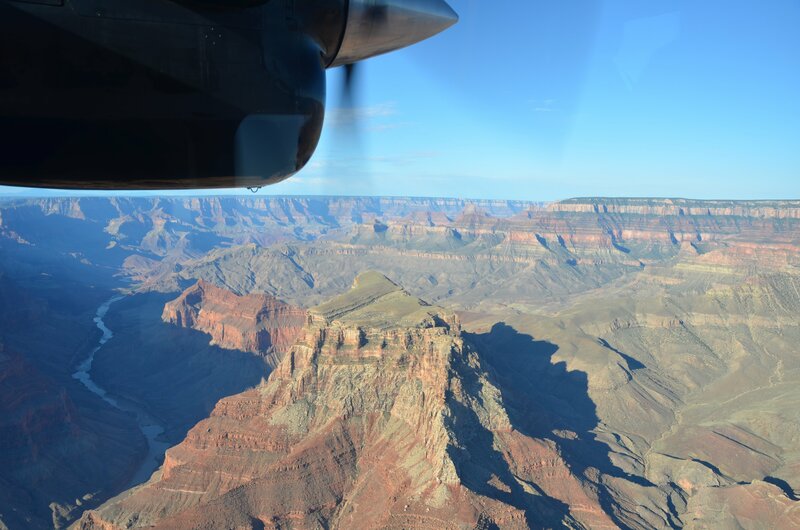 The Grand Canyon has always been high on my list – again because of Thelma and Louise?! 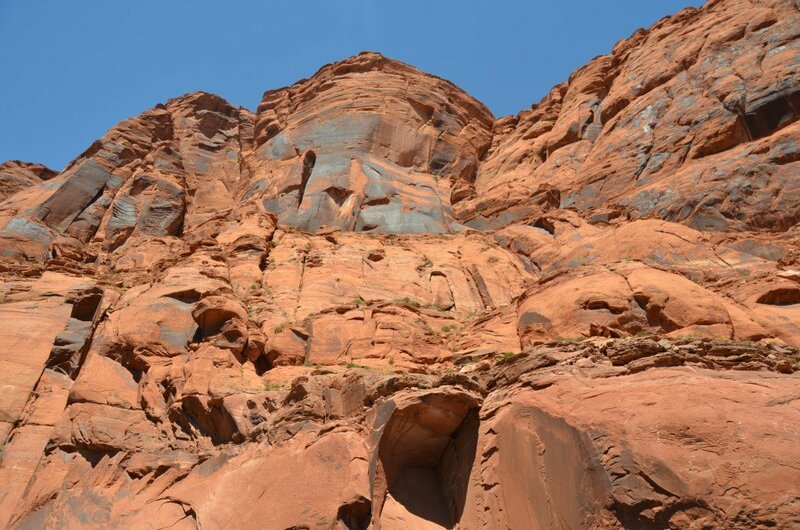 You can spend your whole holiday only here in the National Park, taking an 8-day rafting trip, or why not a helicopter tour, or hiking or taking a mule down into the bottom of the Canyon. We didn’t have that kind of time, though, and wanted to make the most of the two days we did have. 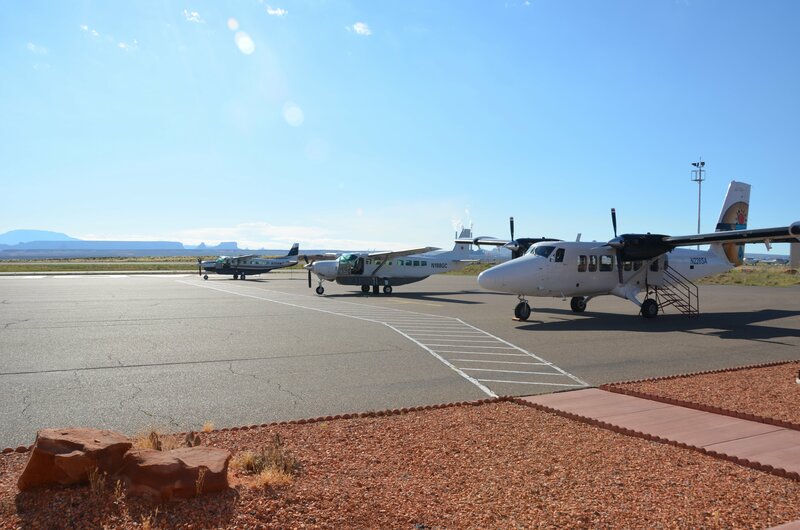 During my research, I had found a blog that recommended the full-day activity tour as the best way to experience the Grand Canyon and it was this that we booked onto. 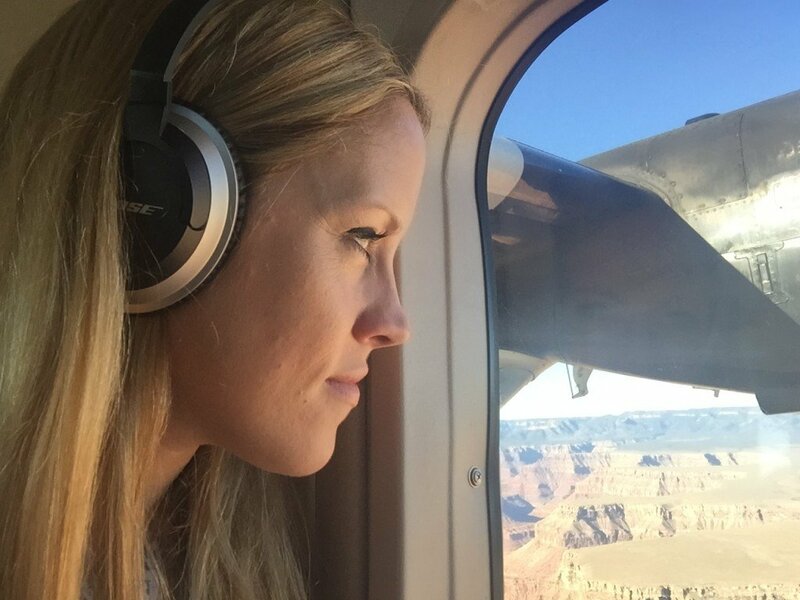 Flying over the Grand Canyon happened to be on my bucket list so what better way to start our day than with a little flight? We set our alarms for 4am and headed off to the airport, just a couple of minutes down the road from our hotel in Tusayan. We got a little breakfast box to eat as we waited for the rest of the group to assemble, and then boarded the planes parked outside. 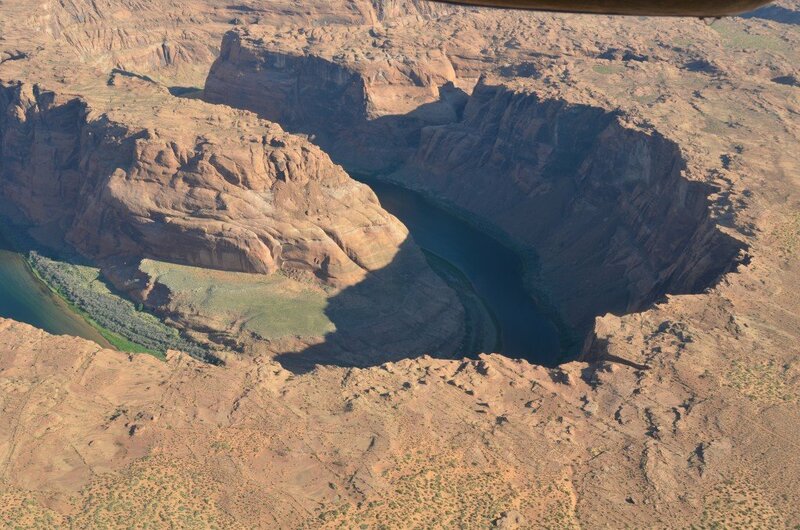 I think we were very lucky that the tour wasn’t completely full as we each got a window seat and a row to ourselves, perfect for gazing in awe at the wonders below and for taking lots of photos. The flight was an hour of WOW! Horseshoe Bend is one of the most photographed areas on the Colorado River and we would later pass around it on our raft. Following the flight, we were loaded onto four-wheel drive trucks that took us onto Navajo land to see the Antelope Canyon, recognisable from Mac wallpapers the world over. 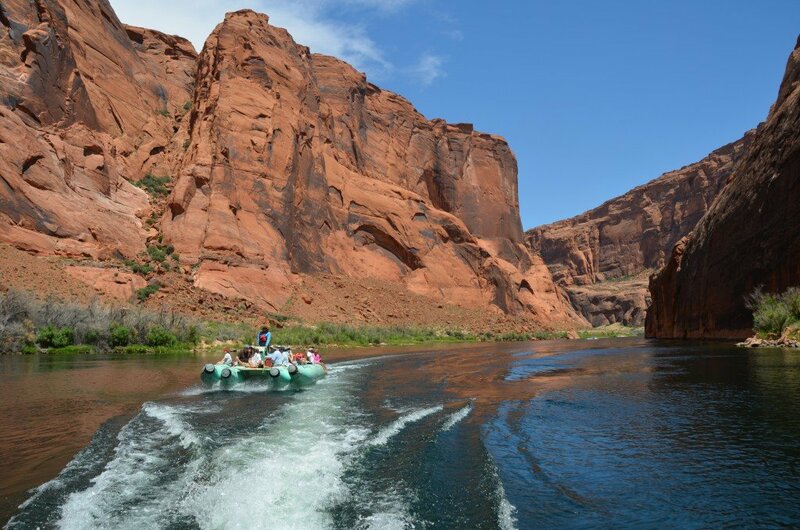 The rest of the day would be spent on the river and we were handed a packed lunch and loaded onto buses that would take us on to the Glen Canyon Dam. 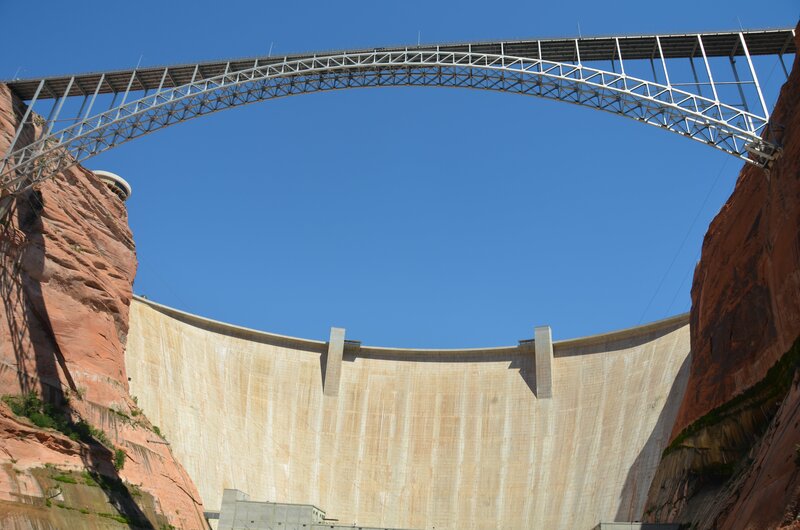 Here we drove through an incredibly long tunnel, right along the canyon, until we arrived at the Dam and donned hard hats to make our way down to the boats. I’ve never seen so many dams in one day! On the bus back to town, we were shown a video about all the people who had died white water rafting down through the Grand Canyon – so I was pretty happy with our smooth water rafting trip! Unfortunately this was all a bit too much for me as that night I lay shivering in bed and the following morning, after very little sleep, I woke up with a fever and a throbbing headache. Sun or heat exhaustion after being exposed all day – but it was worth it, I tell you! 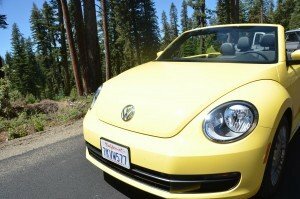 My poor aunt, though, had to then drive the whole way back to Los Angeles airport where we handed back our beautiful Beetle, SNIFF, and the whole trip ended on a bit of a quiet note as I went to bed early on the final night. 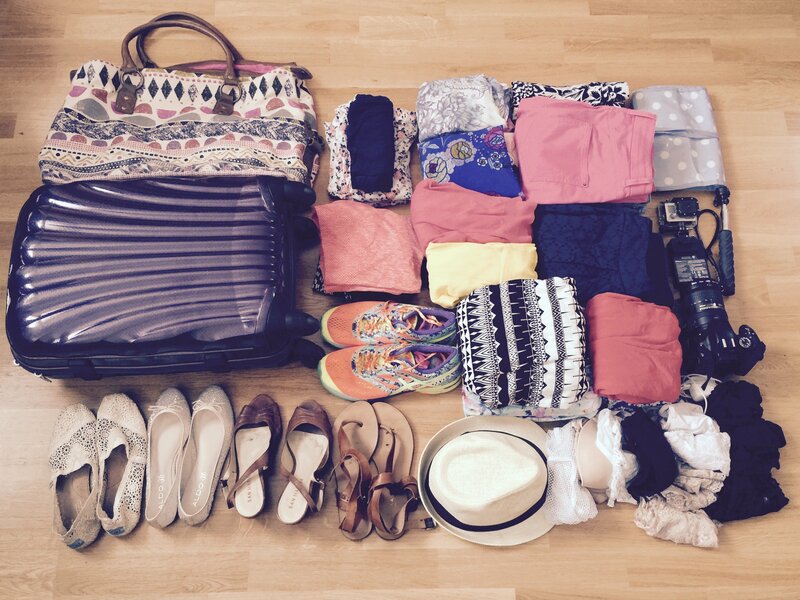 So here’s the overview of our road trip: more than 2,000 miles across 3 states over 10 days! Grand Canyon adventure: We did the Scenic Canyon River Adventure, which includes the early morning flight over the Grand Canyon, a visit to Antelope Canyon, and a 15.5 mile smooth rafting trip down the Colorado River; I strongly recommend that you bring a hat to protect you from a whole day in the sun! 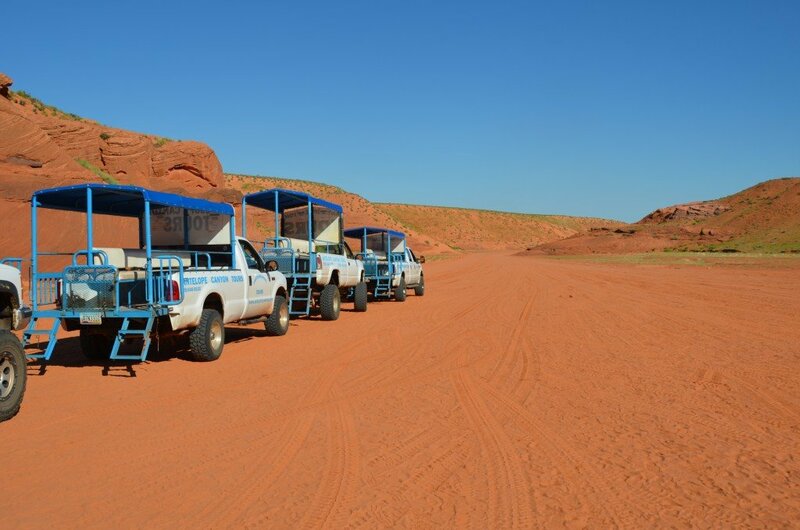 If you want to do one of the bigger tours or take one of the famous mules down into the Canyon, you may need to book this as much as a year in advance. 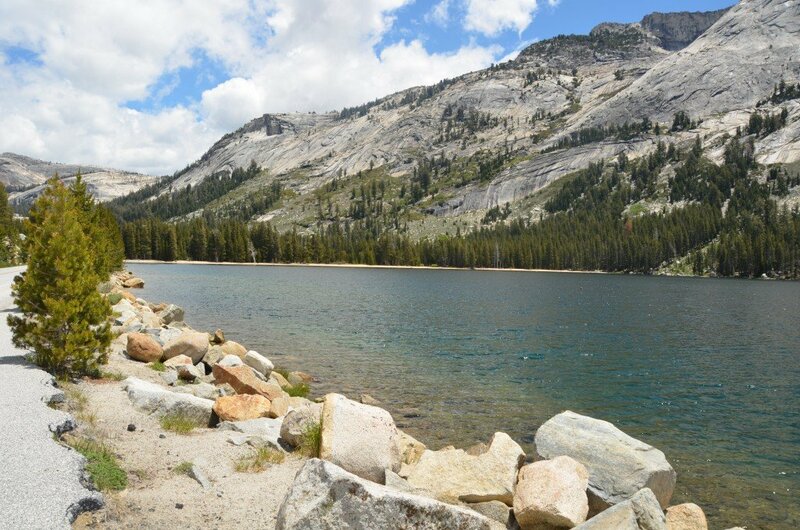 One of my favourite places in the world is Yosemite National Park in California. Somehow it caught my imagination when I went there once with my dad and then again a second time when I visited while he was living and working in San José. I think it was the vastness of it all, the mythology of the Native Americans who had lived there, and the simply breathtaking natural beauty. 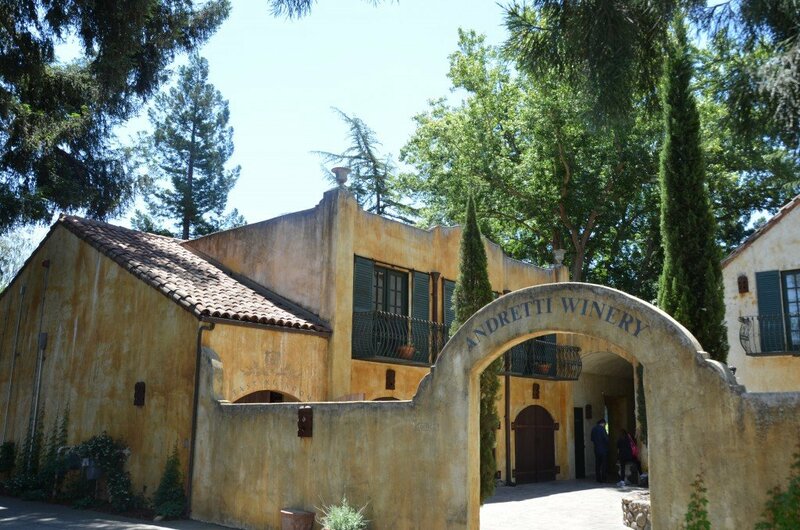 My aunt and I had booked the whole trip quite late, by which time the accommodation inside the Park itself was already full, so from Napa Valley we drove to Mariposa, just outside the Park to the west. When we arrived in the evening at our little hotel, we were greeted by a blackboard with our names and the message, “Keys in the door!” – and so they were. You have to love these little towns where crime seems not to be much of a concern. In fact the owner was still around and we gratefully accepted “some leftover wine”, which turned out to be a whole unopened bottle of Chardonnay, along with homemade cookies. The personal touch! And in the evening, there was live music out on the terrace under the stars. Our first destination was Glacier Point, a couple of hours of driving from Mariposa. The weather didn’t look promising so we headed up as soon as we could in the morning. Just as we had gone round and taken all our photos, the clouds closed in about us, blocking any view of the world below as the rain started pouring down. We were incredibly lucky to have timed the visit so well, and the only downside was that I had to spend a few dollars on a bright yellow poncho to cover my optimistic shorts-and-top outfit I had chosen for the day. As the rain continued, we weren’t really tempted by further exploration of the park so we had a quick lunch down in the village and then drove back out to our hotel. 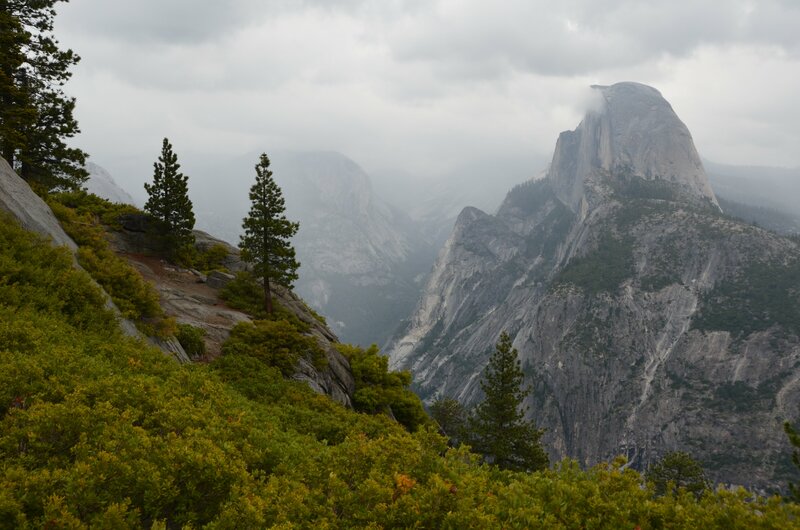 Here you can see the Half Dome off to the right, one of the most iconic sights in Yosemite National Park. It rises 5,000 feet up from Yosemite Valley and the adventurous among you can either hike the curved side (a 14- to 16-mile round trip) or climb the Northwest face over a period of 3-5 days. Good luck! 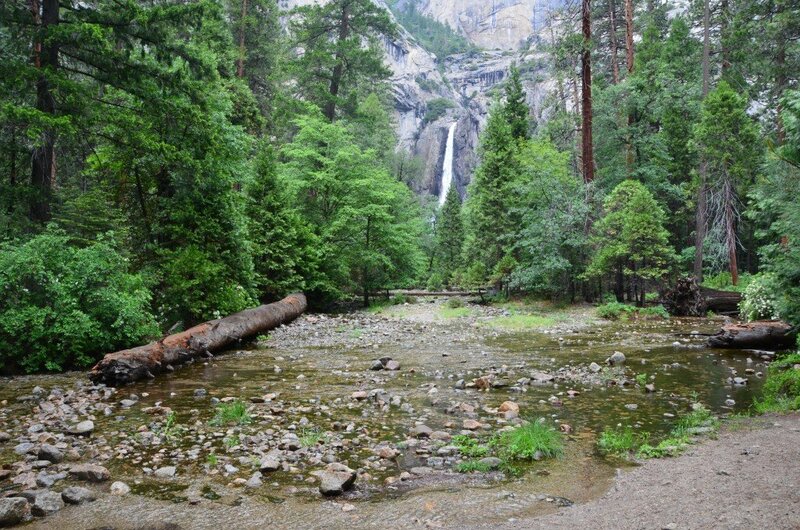 The next day, we made our way back through the Park taking the opportunity to stop off at Yosemite Falls. 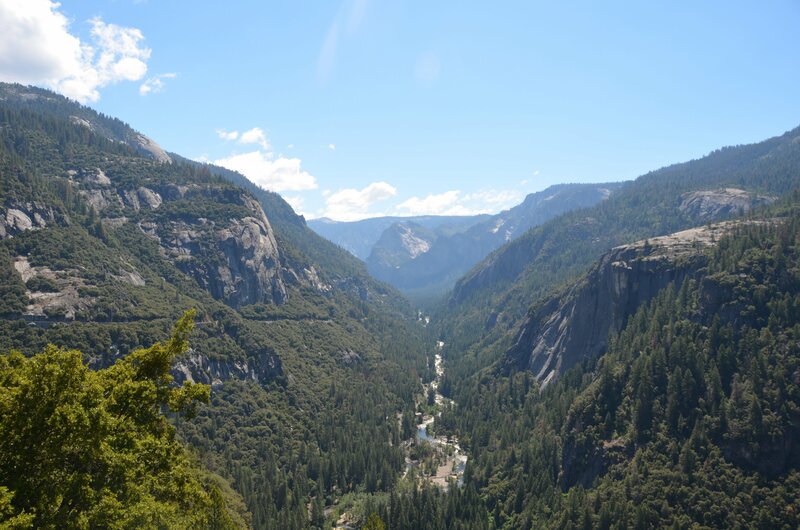 These waterfalls were burned into my memory from my first visits to Yosemite, though the power of the water varies depending on the time of year and the amount of rain. 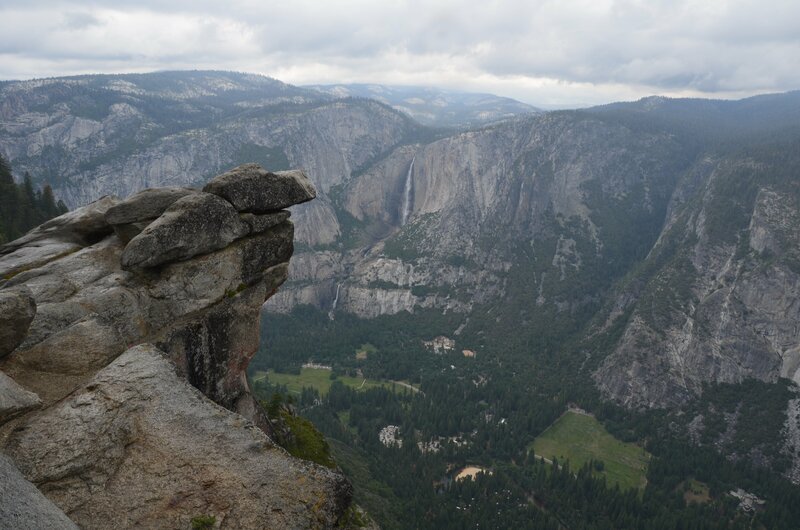 It would have been nice to have had this weather up at Glacier Point the previous day, but what can you do?! Our second stop of the day was unplanned, as road works meant a 30-minute stop in the middle of the forest. We briefly considered climbing up the banks to find a private tree for a toilet break but our common decency prevented us from doing so and we decided to wait for the next actual toilet stop. As we were finally permitted to continue our drive, the scenery changed to become even more dramatic as we passed some great climbing spots and the beautifully serene Lake Tioga. I felt incredibly small in these vast landscapes, both Yosemite and Death Valley. In Europe we simply don’t have this scale; if we were to drive as far as we did in the States we would be crossing several smaller countries and many more towns and villages on the way. 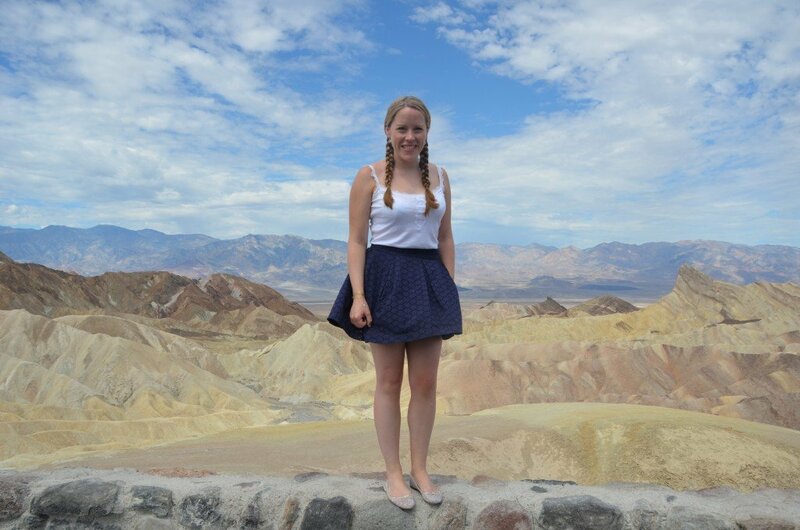 Death Valley actually encompasses the lowest point in North America, Badwater Basin (sounds like something from Doctor Who, no?!) 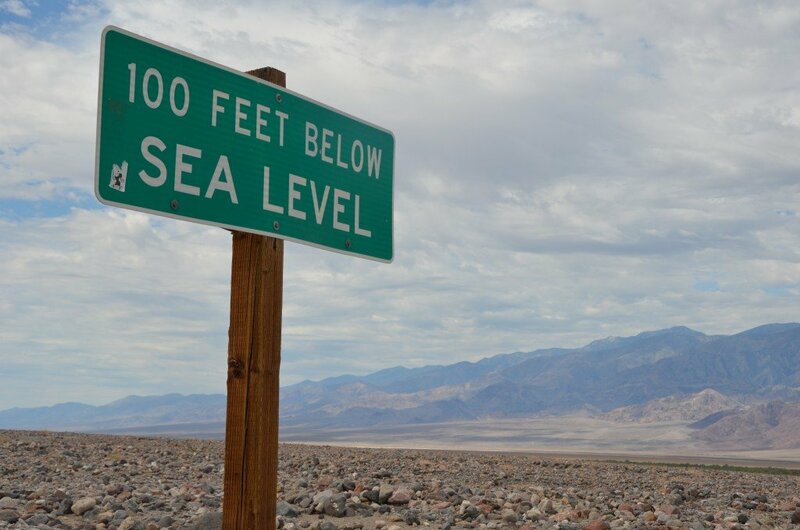 at 282 feet or 86 metres below sea level. 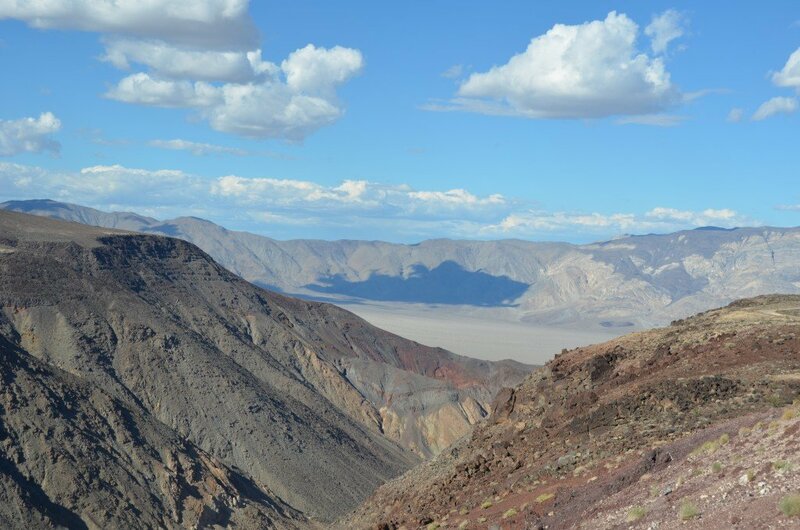 We spent just one night in Death Valley – we had to break up the journey – in Furnace Creek, which according to Wikipedia “holds the record for the highest reported air temperature in the world”, 134 degrees Fahrenheit or 56.7 degrees Centigrade in July 1913. 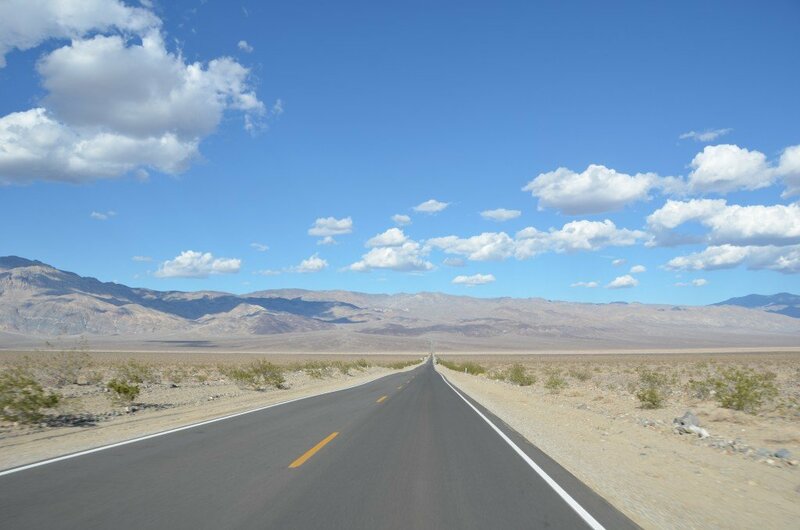 The road stretches out ahead for miles and miles with no sign of life on either side. 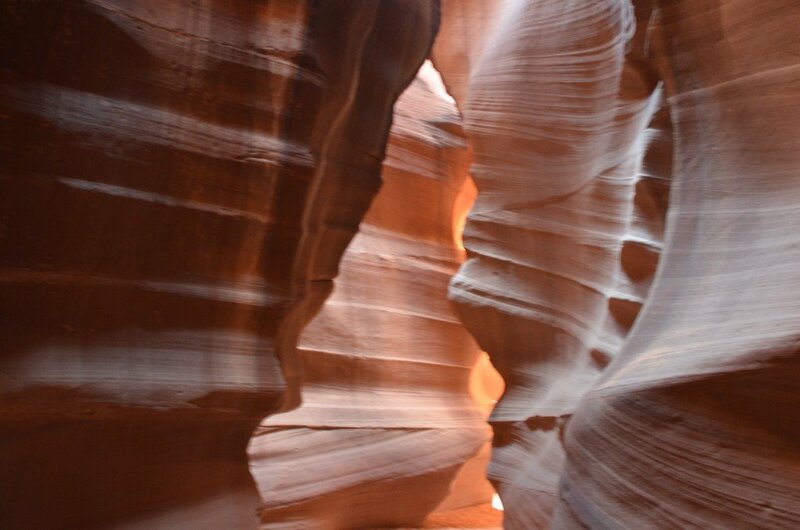 From Death Valley we continued on, past Las Vegas and on to our grand finale: the Grand Canyon. River Rock Inn – This calls itself Mariposa’s oldest motel, although there is a new owner who has taken over this year. I can also recommend Charles Street Dinner House, where we had yummy dinner both nights. 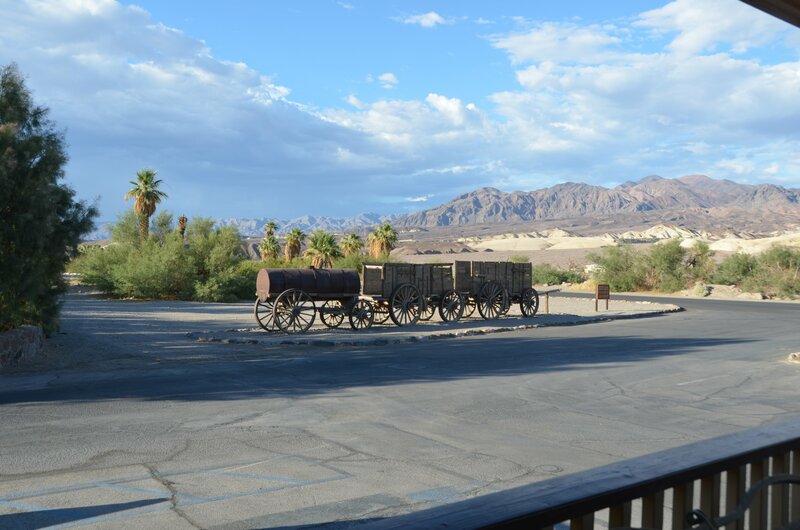 Furnace Creek Ranch – This is the cheaper of the two hotels that make up Furnace Creek Resort, the other one being Furnace Creek Inn. As usual since we booked late we didn’t have a lot of choice but this was a fun place to stay, it felt very “wild west”. From San Francisco and Sausalito we headed out into wine country and kicked off our visit with a glass of bubbly at Gloria Ferrer. 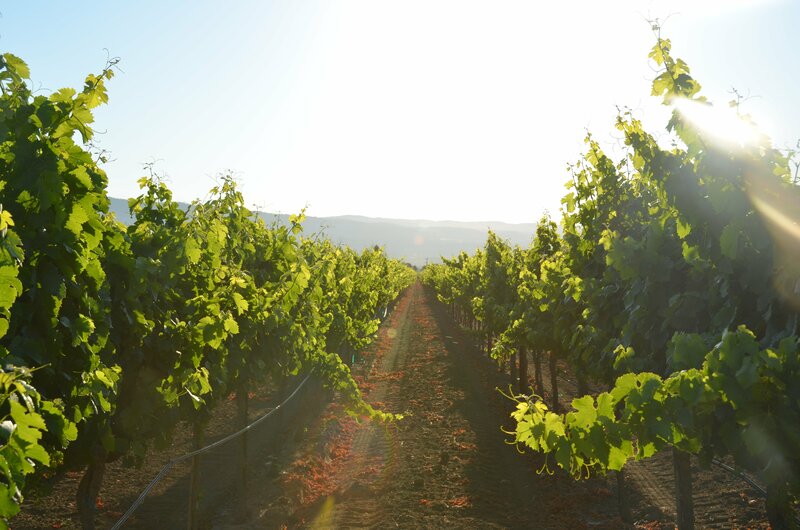 With views across the countryside, this was a beautiful introduction to the world of Napa. 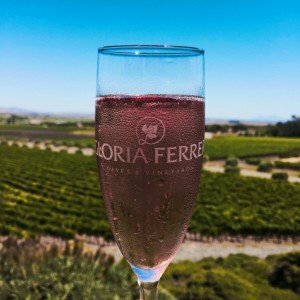 Napa is known for its wine production and yet it only produces 4% of California’s total; at least 95% of the bottle needs to be coming from the area in order to have it named on the label. In 1976, there was a competition organised in Paris in which two French judges did blind tasting of both white and red wine from France and from California… In what became known as the Judgment of Paris, a California wine came first in each category, shocking the French who of course could not believe that the Americans could produce wine of such a high calibre. As if that weren’t enough, a repeat tasting to celebrate the 30th anniversary in 2006 saw California wines take the top five spots again…. Our first pre-planned stop was at Beringer, where we took part in a group tour that took us through the history of the winery and the winemaking process. I found the tasting particularly interesting here, as we experimented with the effect of eating something salty, something sour, something bitter and something sweet on different wines. After this we returned to our hotel for some wine and cheese and an early night, as we would be getting up early the next morning for a full-day tour that began with a ride in hot air balloon. It was my aunt who had suggested the balloon ride and I, of course, said yes although it was only later that I realised that this was actually on my bucket list. We left our backpacks and handbags in a locker as there wouldn’t be space on board the balloon but I still managed to hold onto my phone, my big SLR and my Gopro mounted on a stick. Ridiculous. We drove out into the fields where three balloons lay waiting for us. Each balloon had the ‘cockpit’ in the middle where our pilot would control the burners and then two compartments on either side, each with up to four people in it. 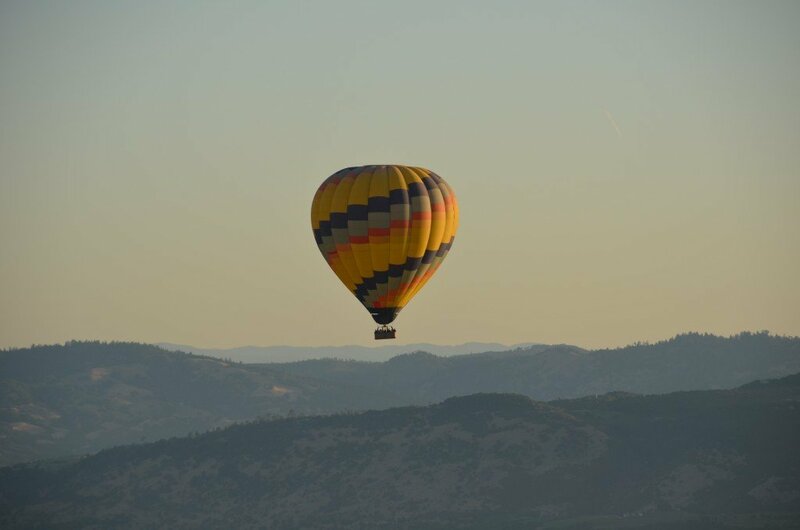 Photo credit: Napa Valley Balloons. 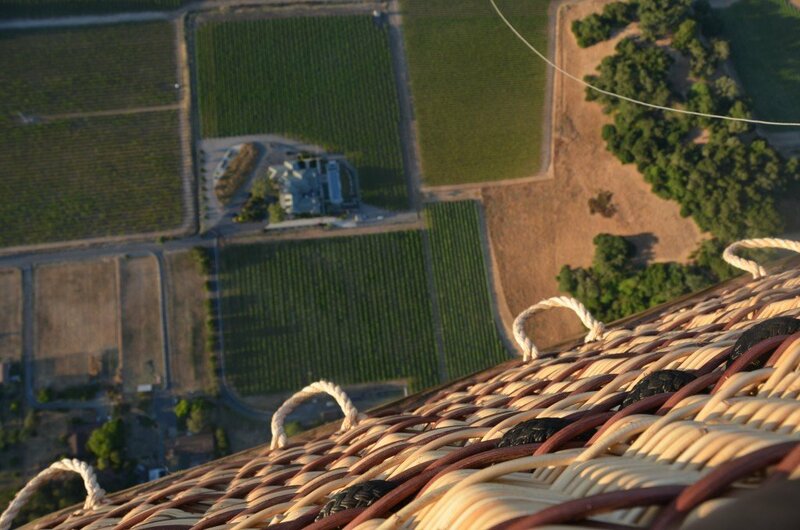 The photo was taken by a GoPro mounted on one of the ropes leading up from the basket. We also had a drone following our balloon as we rose up from the field so if you see any videos on the Napa Valley Balloons site then keep an eye out for my aunt and me! We landed back in a field that reminded me of some American film about alien crop circles. The sun was still rising and yet we’d already had this wonderful experience; I could get up at 4am every day if this were the reward I got! The afternoon tour was a limo ride (“limo” being a bit of a stretch – or, rather, not a stretch, as it was actually a white van) that would take us to four different boutique wineries. The benefit of a tour like this is that you can all drink as much or as little as you feel like, without having the driving hanging over you. It was, as they promised, a very social tour, which saw us quickly bonding with our fellow passengers and culminated in a rendition of American Pie. I blame the wine. You really don’t get drunk, though, as the tasting is spread out throughout the day – it’s the same experience I had when I went on a cycling tour in Argentina, we were unaffected but we had a policeman following us by the end of the day as he was obviously used to rowdy tourists causing mayhem. My aunt and I instead finished off this long day in style with a delicious meal at Bouchon Bistro. 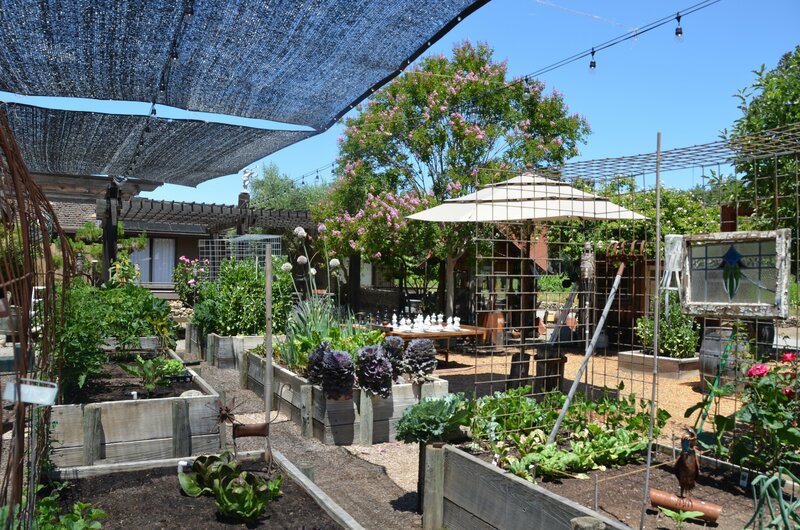 We had lunch after our tasting at Tudal Winery, which had a really nice informal style and a garden where we could cool off a little. 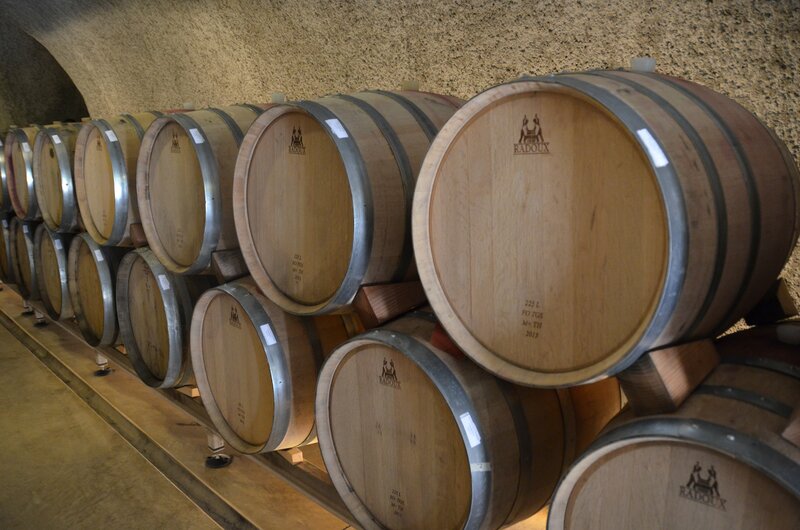 At our third stop, we were led out of the heat and into the caves of Dutch Henry Winery. Our final tasting was at Laird, where we also had some welcome cheese and crackers. 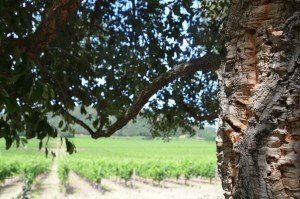 The cork tree really feels like cork: spongey to the touch. In fact the corks at Stags’ Leap are obtained from elsewhere so this tree is just maintained in order to show visitors. 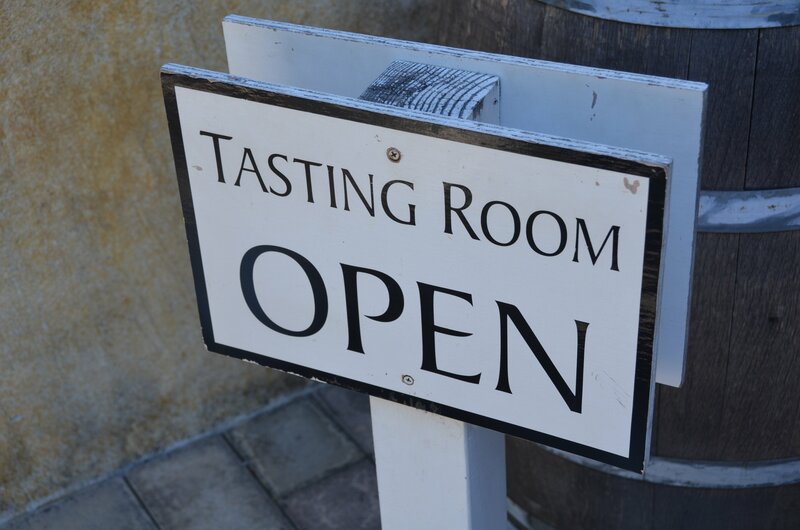 On our final morning – yes, morning – we finished our time in Napa with a last wine tour at Stags’ Leap Winery. Another beautiful location (though sadly they have no licence for wedding ceremonies – I asked) and the story of a strong woman behind it all, involving bootleggers and gangsters (some information on the site but you’ll have to do the tour to get the details!). I’m not sure how much I learned from all this wine drinking, beyond the fact that I seem to like most (good) wines. My nose is somewhat attuned to different scents given that I worked in perfume for many years but I’m afraid I still can’t distinguish different grapes and I still have no idea what type of wine I really like. I did learn that when you want more of a particular wine you should ask to “revisit it” – that sounds much more refined than “Gimme more of that one” doesn’t? Of course the main thing, I think, is to enjoy the wine, regardless of the grape or the vintage. Silverado Resort & Spa – As the name suggests, this is a proper resort and could warrant a much longer stay than the two nights that we stayed there. It was a little out of the way from the action, I found, but I chose it to be within a short driving distance of the starting point for the balloon tour as I knew that this would be an early start. 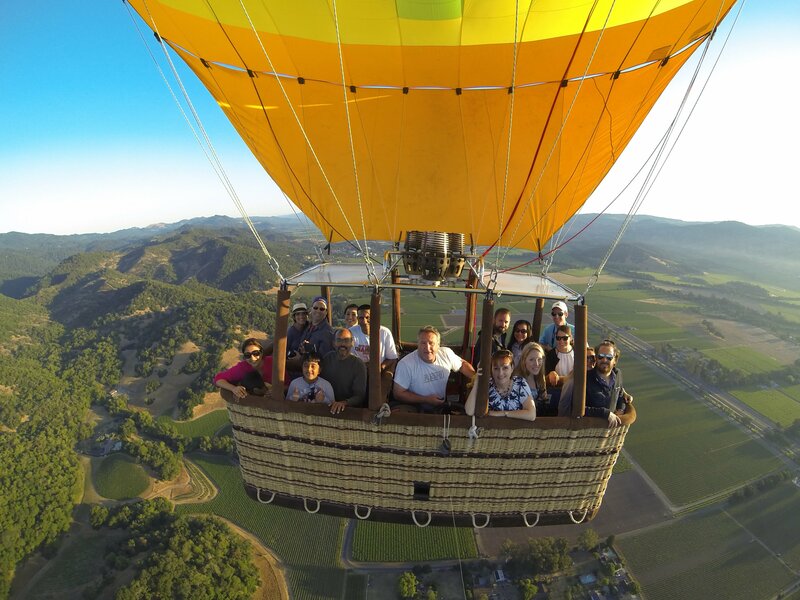 The full-day tour – We did the Platypus package with Napa Valley Balloons, with an early morning balloon ride followed by a tour of some local wineries. 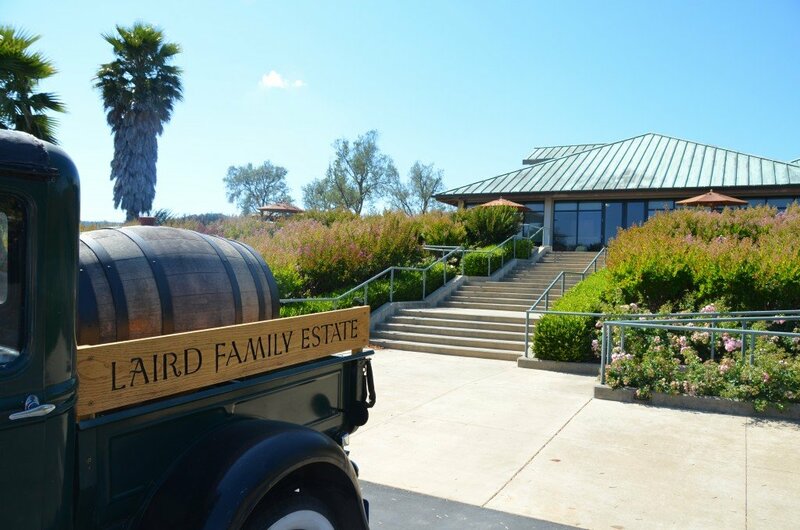 The afternoon wine tour took us to four boutique wineries: Andretti, Tudal, Dutch Henry and Laird. Wine tasting fees at each of the different wineries were not included, which means that you don’t have to do the tasting at each stop if you find it all getting too much!